Villagers in Pant came together at Pant Memorial Hall for its annual Act of Remembrance on Saturday 10th November. At a moving event in Pant Memorial Hall, villagers gathered, as they do every year, to remember and read out the names of the dead from two World Wars. This year, the service was even more poignant as it marked 100 years since the Armistice which saw the end of the First World War. The Memorial Hall in Pant is the village war memorial and was built in 1922 as a permanent reminder of the fallen. 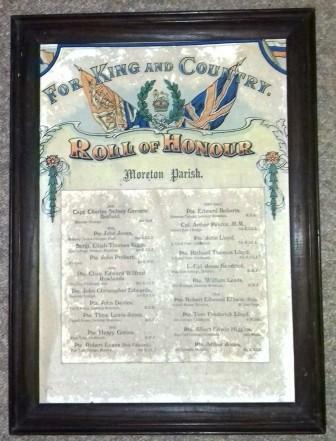 Originally, it held a World War I roll of honour, which was lost over 30 years ago. But thanks to an appeal in the local press, John H. Davies of Crickheath donated a printed version that has hung in his house for almost 100 years. The Remembrance Service was followed by an ‘official opening’ of the newly refurbished entrance hallway. The committee at Pant Memorial Hall recently received a grant of £9,500 from the National Lottery to help pay for the renovation work. The floor of the entrance hall, which had been in place for over 30 years, was badly affected by woodworm and needed to be completely replaced. 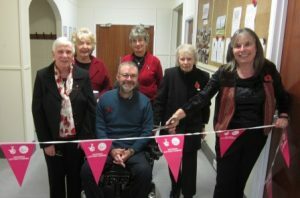 Part of the money was also used to improve disabled access by building an access ramp from one of the fire exits. Pant Memorial Hall committee at the reopening of the hall following major renovation work to the entrance hallway, which was partly funded by a National Lottery grant. Shaun Fisher, Treasurer of Pant Memorial Hall, said: “As our village hall is a memorial to the memory of those villagers that didn’t come back from war, the hall committee is determined to keep it well maintained and up-to-date. That’s why we have invested £10,000 of the hall’s own money in the hallway refurbishment, as a fitting tribute to all fallen soldiers.